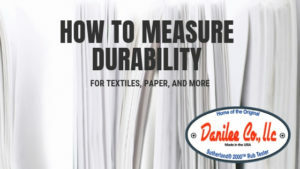 How to Measure Durability for Textiles, Paper, and More | Danilee Co.
There’s always a call to ensure the sanctity of quality in any industry. The concept that you would take anything less is absurd. The assurance that equipment or products stand up to scrutiny will, for the most part, be dependent on your own vigilance. The SUTHERLAND® 2000TM Rub Tester upholds the integrity of the industry standard for testing textiles, paper, and more. It’s easy to claim that any manner of product is the best of its class, but harder to follow through on. The longevity of any product, especially those printed with vital information for use, is essential. It follows suit, then, that you need a product that can abide by ASTM textile standards. Calculating, measuring, and determining the durability of a product are found in the Danilee Co., LLC SUTHERLAND® 2000TM Rub Tester. By performing a rub test on four speed variations and through a variety of cycles, the proper quality assessments can be determined and internal standards set based on ASTM D-5264-98 2011 Abrasion and Rub Testing Standard. Knowing how to measure durability tells you a lot. After all, a product that fails stress testing is inherently inferior. The first step is the most obvious one. While the test receptors can vary by the category of weight you’ll be using, the sample itself should be six by three inches. Make sure the cuts are clean and cut across the grain of the sheet using the included scoring fixture; details are shown on the brochure included with every purchase of a Danilee Co., LLC SUTHERLAND 2000 Rub Tester. This part will present you with all the information you’ll need to determine the durability of your product. The Sutherland Rub Tester presses down on the test specimen and, depending on the speed and weight, measures several variables. Among these are color holding, staining, abrasion, and more. The most important factor to consider when examining the durability of a product is how it stands up to abrasion. An abrasion test determines the durability of a product. How much strain can it endure? How long can a product last? The wear and tear, as well as how long it took to reach that point, speaks toward the quality of any manner of textile or paper. As with any halfway decent process, you’ll need to run the test on several specimens before you can pass a final verdict. While one piece of yarn may have frizzled quickly, another may hold for twice as long. Establishing a field of results helps inform the final evaluation of a decent rub test. The answer on how to measure durability? It all lies in the SUTHERLAND 2000 Rub Tester. Ultimately, the conclusion of a successful abrasion or rub test is self-apparent. By accelerating the wear and tear of a product, you’re able to see precisely understand its quality. The ATSM International industry standard has been thoroughly defended, established, and perfected through the Danilee Co., LLC SUTHERLAND® 2000TM Rub Tester. Every generation of our rub testers has improved on the last, with more power, utility, and reliability as the industry demands persist and consistency is sought after. We have a reputation to uphold. Though it may be copied, the Danilee Co., LLC SUTHERLAND 2000 Rub Tester simply can’t be replaced. Our Customers have stood by our products since 1951 and continue to do so for many generations to come. This is something we do not take lightly. Enhance your durability testing with Danilee Co., LLC SUTHERLAND® 2000TM Rub Tester. Contact us to request a quote today!